Cheshire West and Chester Council is honouring Baby Loss Awareness Week by lighting up Chester Town Hall pink and blue next week. The Civic building will be lit in the special colours from 9 October to 15 October as part of a national campaign involving more than 60 charities across the UK. Baby Loss Awareness Week is held to raise awareness of the key issues affecting those who have experienced pregnancy loss or baby death in the UK. 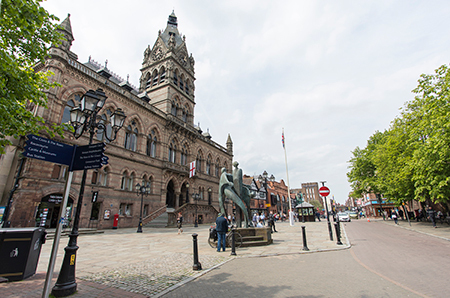 Councillor Nicole Meardon, Cabinet Member for Children and Young People, said: “The Council is joining the rest of the UK in turning public buildings pink and blue to mark this important week. “Throughout the week bereaved parents, their families and friends across the country unite to commemorate the lives of babies who died during pregnancy at, or soon after, birth and in infancy. Baby Loss Awareness Week calls for tangible improvements in research, care and policy around bereavement support and highlights bereavement support and services available for anyone affected by the death of a baby at any stage.